While recent wildfires have occupied the attention of Sonoma County residents this year, another potential disaster sits just down the road in Schellville. There 160 rail tanker cars filled with millions of gallons of highly volatile liquid petroleum gas (LPG) sit in two lines, each a mile long, amid the marshlands. As they sit awaiting shipment to East Bay refineries, each tanker car holds over 30,000 gallons and weights more than 286,000 lb. fully loaded. Many have worried about the potential horror of an explosion at the site. A simple search on the internet under “LPG accidents” provides lists of tragedies caused by a BLEVE – short for a Boiling Liquid Expanding Vapor Explosion. But there is an additional threat to our marshlands north of Highway 37 that is less discussed. The environmental damage and pollution there from an accident at the tanker storage yard could be immeasurable. 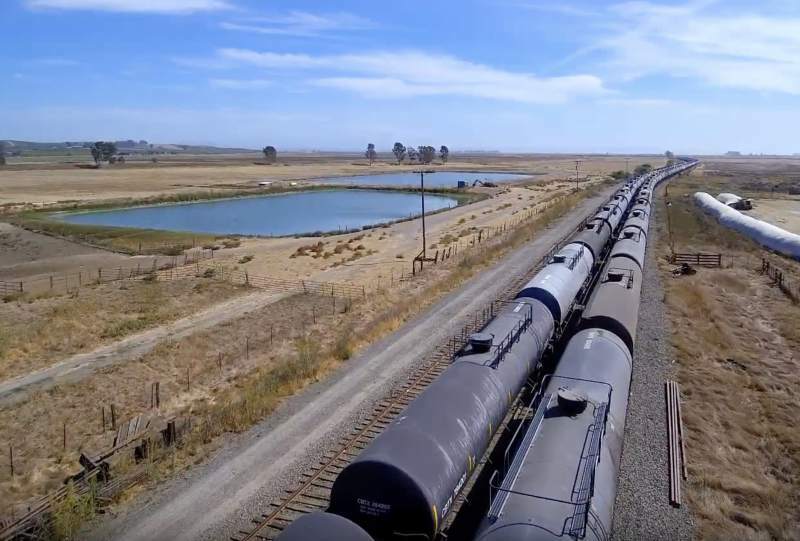 At the Schellville yard, Northwestern Pacific Railroad, the freight hauler, stores as many as 160 tank cars, weighing a combined 23,000 tons, on two miles of tracks that it leases from SMART (Sonoma-Marin Transit). That track is built on a thick underlay of unconsolidated marshland soils that flood every year. Flooding weakens the underlying soils, and increases the potential for subsidence. That danger is greatest at the very time when a large number of loaded tankers are stored there. Their purpose is to serve the winter gas needs of the refineries. Alone that is a recipe for disaster. But that’s not all. This map published by USGS (2010) tells us that the tanker yard lies closely between two parallel earthquake faults, the Rodgers Creek Fault and the Eastside Fault. Unconsolidated marshland soils are marked in light green. San Pablo Bay National Wildlife Preserve is in the bottom right. The blue line is the boundary of the Sonoma Valley Groundwater Basin. For a map of the whole wetlands area and its channels, go to www.mobilizesonoma.org. 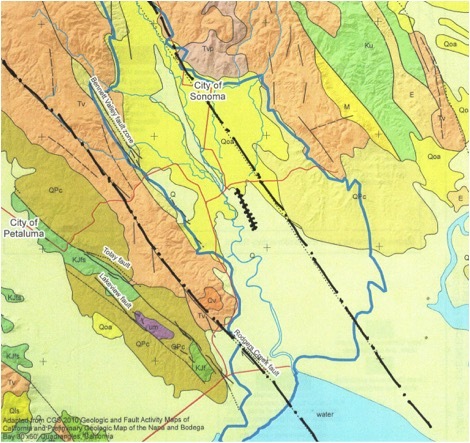 The Rodgers Creek Fault is an extension of the active Hayward Fault that runs through the East Bay, the UC Berkeley campus and San Pablo Bay and north towards Santa Rosa. Geologists indicate it is one of the most likely faults to soon cause a major quake in the Bay Area. The Eastside Fault runs the length of the Sonoma Valley, and parallels the Mayacamas ridge that lies between Sonoma and Napa. Earthquakes are known to cause liquefaction in marshland soils – particularly in saturated soils that are already weakened by surrounding flooding. Liquefaction causes settlement, and settlement can cause track collapse. Track collapse can overturn one or more tankers leading to rupture and spills. A single spark may cause a fire or, at worst, a violent explosion. LPG being heavier than air, it moves along the ground, and if ignited, causes a huge explosion, damaging all around for a great distance. The threat goes further. Using the existing nearby channels, the toxic spill from the tank rupture would surely find its way to the nearby marshlands and channels. From there it is only a short float to the San Pablo Bay National Wildlife Preserve, and to the Sonoma Land Trust’s Baylands Wildlife Area, both places where tens of millions of public dollars have been spent for land acquisition and habitat enhancement in recent years. To make things worse, the local fire departments would use foams and chemicals to fight the blaze in places where water cannot extinguish an LPG fire. The chemical compounds from the foams will damage the nearby dairy’s pasture land and adjacent wildlife habitat, and spread in runoff to contaminate local groundwater and marshlands all the way to the Bay. A combination that is truly a disaster waiting to happen! Write to the media, Let Your Views Be Known! Ask the Supervisor(s) to protect our wildlife sanctuary by removing the Northwestern Pacific Rail Tankers from Schellville. Visit www.mobilizesonoma.org to join Mobilize Sonoma. SCHELLVILLE — Firefighters are battling a three-alarm fire that erupted at a pallet factory south of Sonoma, leading to power outages and road closures around the North Bay, authorities said. The fire was reported just after 12:30 p.m. at Sonoma Pacific, 1180 Fremont Road. By 1:30 p.m., evacuation orders went out for anyone living or working with a half-mile of that address, according to the California Highway Patrol. As of 2:50 p.m., Sonoma County sheriff’s officials said those orders were lifted near the site, but said closures were still in effect for Eighth Street East at Schellville Road and at Fremont, and for Watmaugh Road at Broadway and at Napa/Burndale Road. 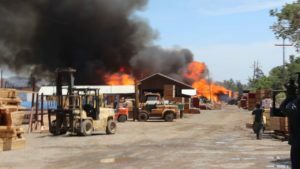 Firefighters Tuesday afternoon fought a large fire at a Schellville wooden pallet factory that forced neighborhood evacuations, blew up a propane tank and drew almost 100 firefighters from Sonoma, Napa and Marin counties. The three‑alarm fire on Fremont Drive was at the Sonoma Pacific Co., the same pallet business that burned in a massive fire in 2013 and suffered a smaller fire in 2007. The blaze became the first for which emergency personnel used a new alert procedure, developed after the October wildfires, to send a message to smartphones in a select geographic area. 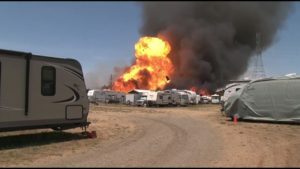 Early reports are that the message, similar to Amber Alerts for child abductions, worked as intended in alerting residents of a mandatory evacuation within a half-mile radius of the fire. He said he arrived to see a plume of black smoke and “a ball of fire” about 100 feet tall. The 12:30 p.m. fire burned about 10 percent of the operation, Mulas said. The cause remains under investigation and damage to the business was estimated at about $200,000. The fire was full contained by 5 p.m., said Sonoma Valley Fire Chief Steve Akre, who helped supervise the fire response. Just after 1 p.m. the Sonoma County Sheriff’s Office ordered an evacuation for a half‑mile around the property at 1180 Fremont Drive due to the threat of explosions and fire. About 500 residents were evacuated, Mulas said. Cynthia Owings, an architect who has lived in a rented home on the nearby RV storage lot for about four years, said she was working at the small farmhouse when the blaze broke out. Her roommate, Maurice Horn, first spotted the fire and told her to evacuate. She grabbed her computer and a few belongings and headed to the nearby fire station. The evacuation order was lifted just before 3 p.m. but several nearby roads remained closed, according to the Sheriff’s Office. Robert Mortensen, facilities manager for Sonoma Pacific Co., said about 40 employees evacuated the site. Soon after getting word of the fire, Mortensen heard “little pops” and then the propane tank blew, he said. The large tank went airborne and landed on Fremont Street. No injuries were reported from the explosion or fire, Cal Fire Capt. Will Powers said. About 90 firefighters responded from three counties along with 28 engines, two air tankers ,and at least one helicopter and bulldozer. The fire damaged about seven recreation vehicles on a nearby property, Mulas said, with two that may have been hit by remnants of the exploded propane tank. Firefighters were able to keep the flames from reaching another 58 RVs, he said. The fire appeared to have started toward the back of the property. Huge mounds of ash were left of what apparently had been stacks of pallets, mulch and debris, and some commercial structures. Some vehicles also burned, including what appeared to be a cargo container and trailer. “It’s a lot of destruction and we feel like we’ve got a handle on it. It could have been worse,” said Akre, the Sonoma Valley fire chief. He estimated the fire was contained to about a half acre of the business property. “The flames were just incredibly high – you could feel the heat all the way out to the road,” he said. He said Tuesday’s fire was smaller in size and scope than the 2013 blaze, but was it was still cause for concern. His company used its water truck to assist firefighter efforts for a couple hours, he said. The same truck was used to aid first responders during October’s fires in Glen Ellen, he said. The fire was near the Schell‑Vista fire station, which was being used as an Election Day polling place. The election workers evacuated, moving to the Seventh Day Adventist Church at 20505 Broadway. The church already was a voting location. The new alert procedures used for the first time Tuesday were developed after the county received harsh criticism for the way it alerted residents after the October wildfires, the most destructive in state history. Under the procedures, for mandatory evacuations the county will use a “wireless emergency alert” system to send messages to smartphone users found inside a designated area determined by the county. If a smartphone in that area is turned on, the device will vibrate and an alert will pop up on the screen, said Briana Khan, a spokeswoman for the county. Sheriff’s dispatchers, in coordination with county emergency management officials, sent out two alerts Tuesday, one in English at 1:28 p.m. and a second in Spanish at 1:39, Khan said. Akre said the 2013 fire on the same property was worse than Tuesday’s blaze. The 2013 fire started when sparks from a tow truck pulling a car dolly ignited dry grass along the road near the business. The flames spread and ignited 40‑foot stacks of wooden pallets and burned 40 acres. Damage then was estimated at $1 million. The 2007 fire was linked to a “heat-treatment box” designed to kill any pests in the pallets. The first firefighters to the scene immediately ordered more help as the fire burned wooden pallets and generated a dark plume of smoke. Schellville is a rural Sonoma Valley crossroads community that connects Sonoma and Napa counties. The business is on a major route and the CHP closed several surrounding roads including Fremont Drive at Broadway, Highway 12 at Watmaugh Road and Fremont at 8th Street East. 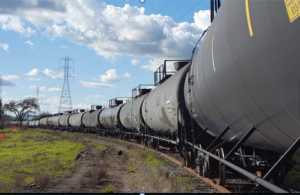 When the skies of Sonoma were an ugly sepia the second week of October, dozens of tankers that may have been carrying a highly flammable mix of butane and propane were stored on rail tracks south of the Carneros Highway. The on-track holding of the LPG –or liquid petroleum gas –tankers was part of an arrangement finalized last year between SMART and the rail carrier, Northwestern Pacific. It was an arrangement that generated community concern at the time due to perceived danger of the LPG tankers so close to Sonoma’s population, and within its agricultural boundaries. That concern was raised anew last month, when numerous social media postings and inquiries received by the Index-Tribune again raised alarm over the possibility of a gas-fueled catastrophe adding to an ongoing disaster. Liquefied petroleum gas is added to commercial automobile fuel during the cooler months, to create a so-called “winter blend” that evaporates, and combusts, at lower temperatures. But according to representatives from SMART and NWP, the actual risk of explosion was slight, and steps were taken by the railroad to prevent any possibility of calamity. “I was in town the whole time, keeping an eye on it,” said Jake Studer, general manager of Schellville depot. “I was in contact with one of the emergency operations center folks the entire time, at least twice a day, to reassure them –or to have them reassure me –that the fire wasn’t going to get any closer. ”He also pointed out that there were no trees close to the tracks, and that the landscape is regularly cleared of brush to within half a mile of the tracks. hundred yards of the tracks near Ramal Road near the Napa/Sonoma county line. But Studer would not confirm that the LPG tankers were on those tracks at that time, nor for that matter what might have been in the tankers, citing federal safety precautions. The controversy became heated late in 2016 and early 2017 when the negotiation between SMART and NWP became public; the resolution was for NWP to have use of the tracks for their freight business even though the lines are part of the purchase or lease that SMART owns, at least in theory. 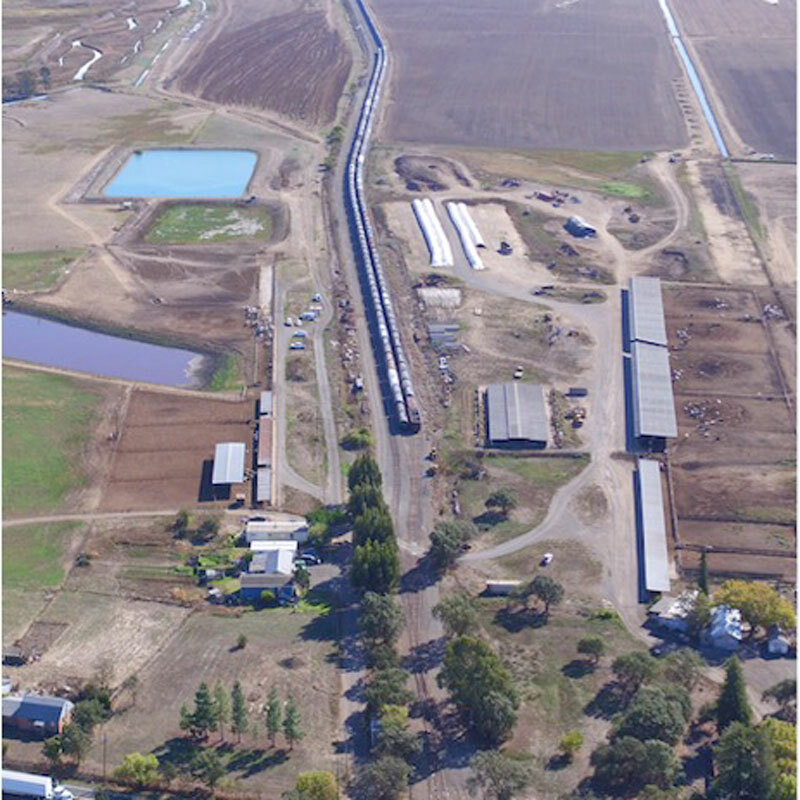 Though their business is primarily commuter transport along the Highway 101 corridor between Santa Rosa and San Rafael, SMART agreed to allow NWP to use the tracks for freight transport in off-commute hours and allow storage of in-transit freight near Schellville, outside the SMART commuter rail service area. LPG is a highly flammable material and previous explosions of LPG tankers in transit have been cited in several rail disasters –the website dot111.info chronicles dozens of these just from 2013. Tankers carrying petroleum or oil instead of LPG have been involved in additional accidents, including a 2009 derailment and fire in Viareggio, Italy, that killed 14, and one in July, 2013, in Quebec that killed 47. However, derailment is usually the precipitating incident in such accidents. Additionally, the tankers implicated in many rail car incidents –so-called DOT 111 tankers –are not presently in use by NWP customers, at least according to Studer. “They were pulled out of service because they weren’t suitable,” he said, saying the tankers being used now are DOT114 and other models. 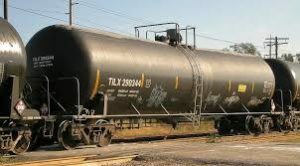 The Federal Railroad administration issued a directive to owners in October 2016 that certain DOT-111 tank cars built between 2009 and 2015 they may have “substantial weld defects” that could result in the release of hazardous materials. Though the rail industry objected to tougher Obama-era regulations to retrofit or replace older rail cars by 2018, the aging out of the DOT-111 is inevitable .“The LPG cars that are used are constructed in such a way that they are impervious to the type of heat that that fire could produce,” said Bosco. “Also, the cars are parked in a place where they couldn’t come in contact with the fires –the fields on both side have been plowed. We weren’t concerned in that respect. ”First District Supervisor Susan Gorin, in whose district the Schellville tracks are located, has in the past asked for greater oversight of the Schellville yard and its use for storage, though because of the risk of LPG fires. Flooding from rising sea water and the proximity to valuable vineyards are also of concern to Valley economy and livelihood, she has maintained. Gorin was unavailable for comment on the issue this week, her office citing the post-emergency workload of the Board of Supervisors. Authority) and the freight carrier requires that (NWP) implement public health and safety measures, including having an emergency response plan, safety and security procedures and safety protocols,” said SMART spokesperson Jeanne Belding. It looks like those railroad tankers parked on the tracks near Schellville may be there for a while, under terms of a 30-year agreement reached between Sonoma-Marin Area Rapid Transit (SMART), which owns the rail lines, and the North Coast Railroad Authority (NCRA), which claims freight rights. The agreement was approved by the SMART board of directors on Wednesday, Feb. 15, one week after the NCRA signed off on it. SMART officials and Valley residents first went public with their concerns in September, saying that the 80 tankers filled with 2.6 million gallons of liquefied petroleum gas (LPG) stored in Schellville at that time posed a potentially catastrophic risk to public safety. The site is about 13 miles east from where SMART plans to begin passenger service later this year, but only about three miles from the Sonoma Plaza, and less than half a mile from the Sonoma Valley Sanitation District’s reclamation plant. SMART objected to NCRA and the local rail operator, Northwestern Pacific Railroad (NWP), about their right to store the tankers on lines that SMART owns. Although the light rail transportation company has no plans to open a route from Novato or San Rafael into the Sonoma Valley, they own the rails to the Lombard Station in Napa County. The NCRA appealed to the federal oversight agency, the Surface Transportation Board, on the grounds that interstate commerce trumps all when it comes to what is carried on rail lines. The STB is a five-member board, all appointed to five-year terms by the President and confirmed by the Senate. Adding incentive to the negotiation was the fear that if the STP sided with Northwestern Pacific, SMART would lose all rights to limit storage of tankers anywhere along its lines – including in the prime and populated 101 corridor, from Larkspur to Healdsburg. Liquefied petroleum gas (LPG), typically a blend of propane and butane, is added to winter blends of gasoline to increase its volatility – it burns better in cooler weather, and it can be cheaper. It’s generally the same stuff used in a propane tank for barbecues, but ratios of propane and butane differ. The LPG that was stored in Schellville in September was eventually shipped to East Bay refineries including Valero and Tesoro for use in winter fuel blends and, according to shipping manifests, the tanker cars that are in Schellville now are empty – though they will be swapped out for full tanks later this year. Under the terms of the settlement, the freight operator is agreeing to disclose manifests that include hazardous materials and to provide that information to first responders and SMART dispatch. They also found agreement on a co-schedule that will allow freight rail on the SMART lines through the 101 corridor, on hours when passenger rail is minimal or absent, from 10 p.m. to 6 a.m. 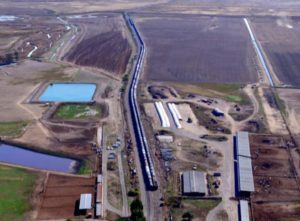 But the agreement also drops the appeal to the federal Surface Transportation Board, and gives the railroads the right to store up to 160 oil tankers at what they are calling “the Schellville yard” – 80 tank cars each on two 6,000-foot long spurs running south from the area of the obsolete Schellville Station, at the intersection of Highway 121 and Eighth Street East. That agreement pitted supervisor against supervisor, district against district in Sonoma County politics. And it’s the 1st District – where the gas tankers are located – that’s getting the raw end of the deal, according to Supervisor Susan Gorin. Following the agreement announced on Monday, Gorin fired off an early-morning email to the SMART board – which includes her fellow supervisors David Rabbit and Shirlee Zane. “Needless to say, I am not pleased with the agreement that allows tankers to be permanently stored in Schellville, one of the most fragile, and vulnerable areas in the County and an area highly susceptible to flooding and bay level rise,” wrote Gorin. “You represent Sonoma County on the SMART board, but apparently not Sonoma Valley,” she concluded. Which may explain why Supervisor Gorin was present at the SMART board meeting in Petaluma the next day, Feb. 15, that approve the negotiated agreement. Repeating many of the objections she made in her email, she also brought up concerns about projected sea-level rise that affects southern Sonoma County. “In a matter of decades, a lot of this Valley real estate will be under water or threatened because of inundation. This is exactly the wrong place to store LPGs or tankers in any part of this area. 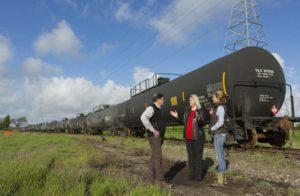 “The very fact that they have to move the tankers just reaffirms how serious this area is for flooding,” she added, referring to some confusion over why the tankers have been seen in various parts of the Carneros region, not only in the Schellville yard but three or more miles away in the flats east of Ram’s Gate and Viansa Winery, within sight of the Sonoma Raceway. Following the SMART board’s unanimous vote to approve the agreement, Gorin announced that she will be calling a public meeting in the next few weeks, inviting SMART’s chair Deborah Fudge, Director Mansourian, and Rep. Mike Thompson, among others.